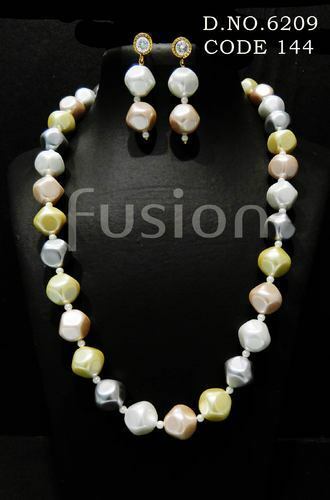 Fusion Arts started its business in the year 2007 as a leading manufacturer, supplier, exporter, wholesaler and importer of Necklace Sets, Pendant Sets, Bangles and many other jewelry items. This Partnership firm registered under Indian Partnership Act 1932 is certified by IJMIMA trade membership and NSICCrisil Certificate. Our exclusive range is made under the strict guidance and support of the industry heads, who keep an eye on every phase of the production processes to ensure that they are free from any defect. Moreover, our comprehensive range is extensively demanded and appreciated for their elegant look, long lasting sheen, fine polishing, excellent strength, optimum finishing and aesthetic appeal. To meet the clients’ varying requirements, we offer our range in varied patterns, colors, sizes and other specifications. Our experienced and strong staff enables us to offer the products within the committed time frame.